Welcome to Pilgrim-info → the home of those wanting to pray every day, make a pilgrimage, attend the holy mass with joy…and live fully as we are meant to be. Do You Dream of being able to Pray every single day? If you dream of being able to pray every day then you’re at the right place! Pilgrim-info.com is all about inspiring, teaching and supporting Catholics and those who are open minded to make their prayer an everyday habit and with that make a better life for themselves, their family and local community. 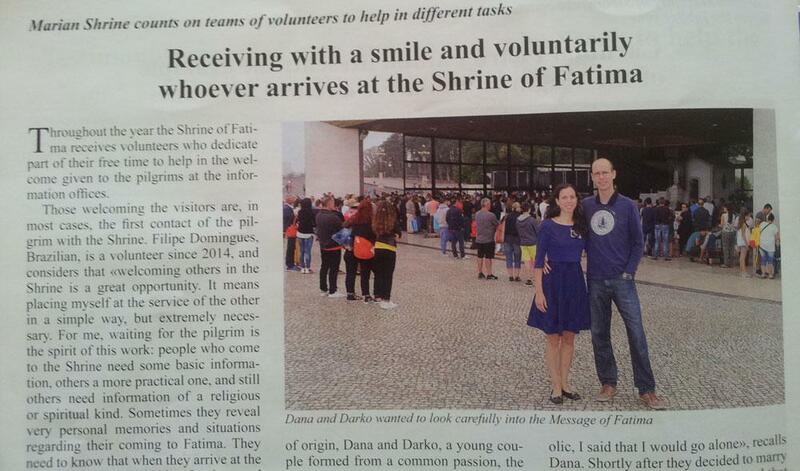 Our Journey: From what is Fatima, to being volunteers there! Our story goes like this: Dana was raised in a Christian family and met Darko (non catholic) in 2008. Later we became a couple, discovering our differences but also kindness and good hearts in each other. In 2012 we attended 8-month group wedding preparation program. The next year Darko decided to receive all sacraments and from that moment on, our beautiful journey of faith started. Together we attended catechumenate meetings every Wednesday for the whole year. Dana wanted to be supportive, but at the end, she too opened her heart to God more after these catechumenate meetings. Even though she already had all sacraments, this was like a new birth for her. On May 25th 2014, Darko received Baptism, First Communion and gifts of the Holy Spirit – Holy Confirmation. One month after, we got married by Franciscan priest. We feel every day like we had the most blessed wedding ever and that our Father is blessing our marriage every day more. The new, real journey with God started after our wedding, when normal, ordinary life began. We like to pray the rosary, go to the Mass and attend the Eucharistic adoration. We both made personal consecration to the Immaculate Heart of Mary and to the Sacred Heart of Jesus. 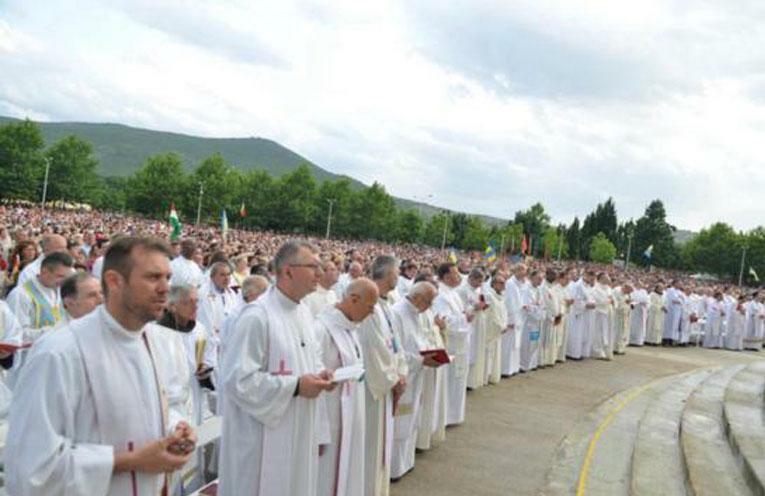 Coming to Fátima in 2016 was an experience of our hearts for life. We found it to be perfect opportunity to serve with volunteer work and good deeds and prepare ourselves for family life. When we returned from Fatima, we wanted to share information and faith, hoping it would help others on the same journey. While a blog about faith and prayer is nothing even similar as the real sacraments – it may help people who are seeking info, comfort and company of the equal minded people. Weekly Lectio Divina contemplation – the best way to start praying. Interesting Facts about Shrines around the world. Other news from the community. We pick a monthly Winner – a FREE Rosary from a famous Shrine. It’s completely free and we promise to keep your email private. We hope that you’ll find Pilgrim-info useful for you. Please feel free to join us in comments or reviews around the site or write us a note via media pages – we are active on Twitter and Facebook, Pinterest and Instagram and we look forward to connecting! What is the Sacred Heart of Jesus meaning and history? Get the confirmation names for girls and boys in one place! Why should you read Story of a soul? Autobiography of St. Therese of Lisieux. Here is why! Sanctuary of Our Lady of Fatima, Portugal: What to see in one day. And why should you stay longer. Empty tomb of Jesus – What question, if I got an answer to it, would open up my heart to Easter morning?